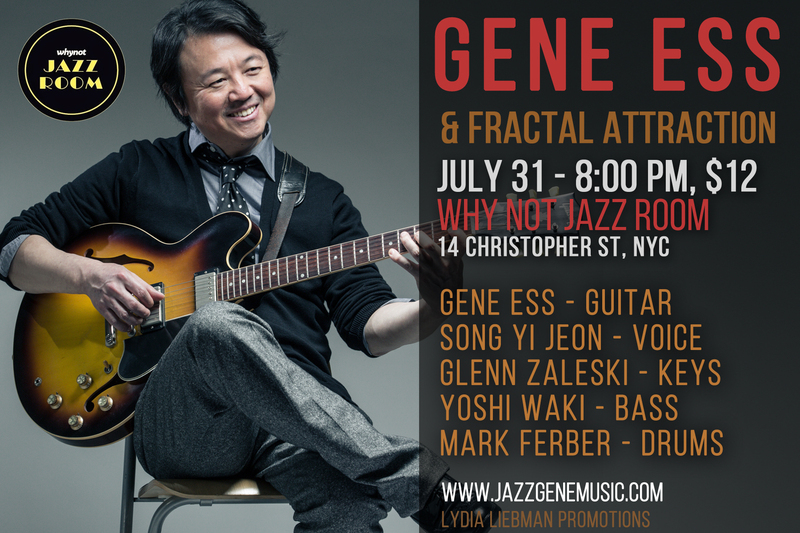 Whynot Jazz Room, located at 14 Christopher Street, New York, NY, is proud to present jazz guitarist and compose Gene Ess and Fractal Attraction on Friday, July 31 at 8:00 PM. The music charge is $12. Fresh off the heels of their latest release, Eternal Monomyth, Gene Ess and Fractal Attraction have been solidifying themselves as one of New York’s premiere collectives featuring original material that explores the use of the voice as an instrument in a chamber group setting. Eternal Monomyth is the riveting companion piece to Fractal Attraction, which was the winner of the SESAC Outstanding Jazz Award in 2010 and peaked at number 3 on the jazz radio charts. This version of the group will feature Gene alongside vocalist Song Yi Jeon, keyboardist Glenn Zaleski (“…an excellent young pianist notable for both his harmonic insight and his rhythmic composure…” – The New York Times), bassist Yoshi Waki and drummer Mark Ferber.